Here at South West Steel Supplies we can offer a Steel Profiling service. Computerised profiling machines combined with our comprehensive stock of mild steels means we can deliver a one off part or hundreds of profiles finished to your specification. 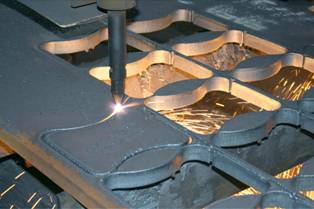 Accuracy, repeatability, outstanding quality and design flexibility are on offer with laser cutting. Mild steels and a variety of other materials can be cut to your exact requirements. For more information give us a call or fill in a request a quote form, your drawings or files can be uploaded for quotation purposes.